Dennis Rogers is in his third season with the Clippers, his second as the Director of Communications. Last season, he also served as the Director of Digital Media for the Clippers, helping push the digital-side to the top 10 in every social media and website category in the NBA. In his first season with the Clippers, Rogers served as the Director of Team PR and Publications. 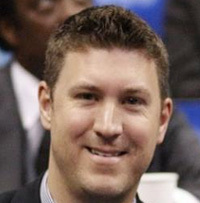 Rogers came to the Clippers in December of 2012 after serving nine-plus seasons for the New Orleans Hornets as the Director of Basketball Communications. He started with the Hornets in July, 2003 as an intern and moved up the ranks serving every role in the department towards his final five-plus seasons as the director. With the Clippers, Rogers coordinates all player interview requests for local and national media members, writes news releases, helps compile statistical needs and research for the coaching staff and travels with the team. He also helps manage the Clippers website and social media platforms as he implements strategic changes to better enhance the digital media side. Last season, the Clippers had the highest increase in social media followers across all major channels. Rogers served as the Director of Public Relations for the NBA Summer League (formerly the Vegas Summer League) where he coordinated all public relations duties for the league and wrote all content for the website and the media program from its inception in 2004 until 2008 as it grew from a six-team league to a 21-team league in just four summers. For the past five summers he has served as an assistant to the summer league, promoting the league through all aspects of social media and marketing. Prior to joining the Hornets, Rogers served as a basketball operations assistant for Momentum Sports Agency in San Antonio and interned with the Dallas Cowboys during the 2002 season. Rogers graduated from Southern Methodist University in Dallas with a bachelor’s degree in corporate communications/public affairs with a minor in religious studies. He served as the graduate volunteer under head coach Rick Stansbury for the Mississippi State men’s basketball team during the 2000-01 season, during which the Bulldogs were 18-13 and appeared in the Elite Eight of the NIT Tournament, while pursuing his masters in sports administration in Starkville. Born in Los Angeles, but raised in Texas, Rogers grew up in Dallas and San Antonio and is an avid Dallas Cowboys and Texas Longhorns fan. He resides in Santa Monica.